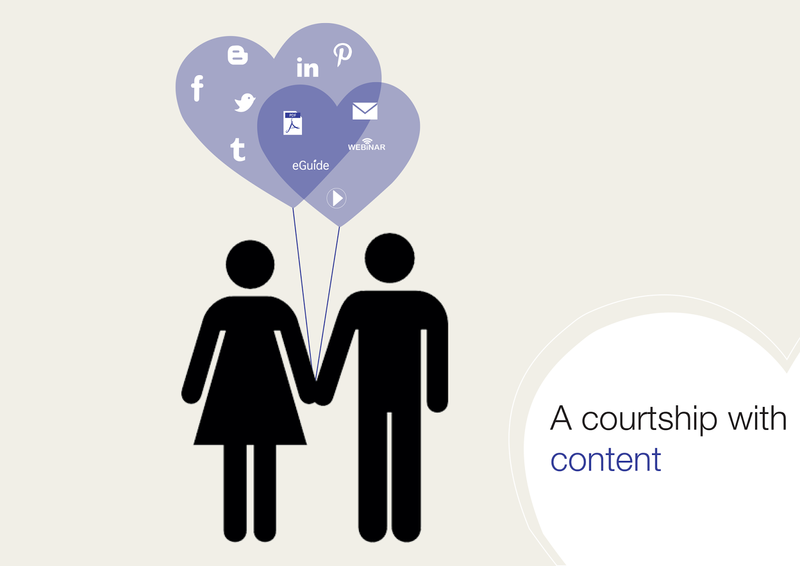 There are many ways in which using content to win new customers is like trying to find a romantic partner. Not only do you have to stand out from the crowd and attract someone, but then you have to face the tricky business of keeping them interested too. 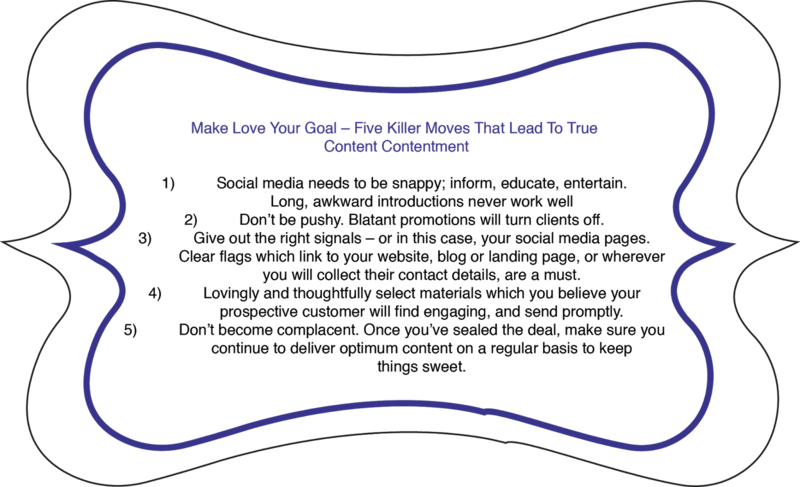 Like the Frankie Goes to Hollywood Christmas hit that somehow finds its way into your CD player every year, we believe that you should make love your goal when it comes to shaping and using your content. Okay, so we’re no authors of Mills & Boon type romance novels, but a business to business marketing relationship can be compared to that of a blooming love affair of the 21st century. Take for instance, the initial meeting in which your target customer comes across your social media content or e-shot. For any social media content to drive visitors to your website, the media needs to be informative, entertaining and educational, not pushy – no avert promotional plugs please. Just like a cheesy chat up line which is transparent and quite frankly, embarrassing, the first encounter should be natural, with genuinely personable content leaving the visitor wanting more. Now you’ve snagged your ideal buyer persona’s attention – they’re aware and quite intrigued by your existence – you obviously want their mobile number, or by extension, contact name, email address and company details. For that to happen, they need to be pushed just that little bit extra to your landing page or website, so clear flags need to be posted such as links or buttons on your Twitter, blog, Facebook or e-shots. You wouldn’t have acquired your current boyfriend/girlfriend’s number without asking directly, would you (unless you’ve used some worrying tactics) and so, overt calls to action such as ‘Visit our page to find out more’ are vital if you want to further develop a relationship. Fantastic, you’ve nabbed their digits, they have subscribed to an affair with your content, but will the affair turn into a fully-fledged committed relationship? Flirt on, content strategist, as this is where you drip feed the prospective customer with love letters or more specifically, in-depth marketing materials such as white papers, e-guides, webinars and videos. Don’t be shy, show off all your qualities! As you would optimise your appearance for a video chat with your crush, optimise your content to really exhibit how brilliant your brand or service is. Furthermore, just as we all moderate ourselves to an extent to fit in with our perceived idea of what our lover wants, select materials which you believe are relevant to the prospective customer. For example, if you have a white paper which details your understanding of the type of service they’re likely to need, send, send, send! Now your love interest is seriously considering making the pair of you official, consolidate the business partnership and nudge them into actually paying for your products or services. This is achieved only through authenticity and clear presentation, with media such as product literature, testimonials and case studies being the most appropriate. Just as it would be better for you to get a friend rather than an ex to sing your praises, ask current clients to review your relationship, and communicate their positive comments to the potential customer. So the deal is sealed, your bond has been validated for the entire world to see, you now have another client and a return on investment for all that hard work optimising your content strategy, or alternatively, staggeringly impressive pulling tactics. But remember, a happy customer will promote your company to other potential clients, leading to more business. You wouldn’t want your partner to badmouth you to his/her friends and family, would you? So don’t become complacent, wine and dine your client to keep them engaged. Keep drip feeding them content to remind them of the brilliant customer experience they have had or are having with your business, offer news and views on themes which you know will draw them back in. A good relationship also provides a platform for you to inform them of other products and services that may complement their needs – surprise your darling, you’re not afraid to try something new – and before you know it, you’ve optimised on the potential ROI your content marketing strategy can achieve. You’re the real-life Romeo of the content marketing universe!